NOTE - 02.07.11 - As of today I'm sad to report that I can no longer offer the 100% free study guide that was previously posted below, as that guide is now for sale. The good news is that some of the components of that study guide are still available for free on the Studio 4 website. The sections of this post originally referring to the free study guide have been edited accordingly. Last week I wrapped up a four week training course training people at my day-job to pass the LEED Green Associate exam. As part of preparing this course, I asked various companies to provide me with their training materials. The result is hopefully a high pass rate from the people in my class and a great opportunity to make some recommendations about what (not) to buy if you're preparing for the same test... I'll also cover a four week curriculum that I think should be sufficient for most people to pass the test. What this post will not cover are the logistics of applying and registering to take the test and everything about the various tiers of accreditation. The Green Buildings Certification Institute has done a pretty good job of explaining those subjects in their Step-by-Step guide and the Candidate Handbook. If you have not read the Candidate Handbook at this time, I strongly suggest you do so before reading the following. This post is about how to study for exam, not how and why you do it. How Long Do I Need To Study? I believe that you can learn what you need to pass the exam on a four-week regimen. I developed the following reading assignments for those in my in-house class. For that group I also used a variety of third-party study guides for homework assignments and practice questions, but I've pared down the suggested reading here to only include the primary references (documents that the LEED-GA exam questions are pulled from). All of the primary references save one can be found via the LEED GA Candidate Handbook free of charge, just go to page 14 and click on the links. The problem is that the references don't really tell you what's important... learning everything listed would be insane (way too much info), and it's tough to get a feel of what to skip and what to focus on. What Study Guides Do(n't) I Need? Cons - First, the LEED Core Concepts Guide is the only primary reference listed by the GBCI that costs money to access. I can understand third parties developing content and needing to get compensated for their work, but the USGBC should make every effort to minimize costs for educational purposes. (NOTE: I don't have a problem charging for the accreditation, but I think the education should be free.) Second, the two books are almost identical in content, and they should have been combined from the start. It's frustrating having to bounce between the two to find the one or two things mentioned in one that isn't mentioned in the other. Third, the books are much smaller than the images the USGBC website (also shown on the left) would have you believe. The cost to content ratio is not very favorable. Pros - Despite the above, I did find a few things helpful in these guides. First, the practice exam questions listed in the study guide (60 total... not enough for a full test) are the only questions available that have been approved by the USGBC. Second, as someone teaching a LEED GA training course, the way the GA Study Guide was organized was well suited for teaching the content. Third, though I might argue it's possibly too concise, these guides don't waste time with unnecessary details. I also liked the definition flash cards they created that comes included in the GA Study Guide. Who should get these? - I would not recommend buying these unless you plan on teaching a LEED GA class, as some of the questions, exercises, and some of the graphics listed in the LEED GA Study Guide were quite helpful. I wouldn't recommend anyone buy the Core Concepts Guide... save your money! 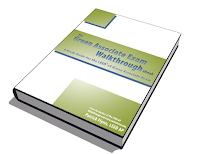 Pat at the Green Exam Academy still keeps a fair amount of free resources on his website, including some very helpful, very basic info in case you're just getting started. He's also created a study guide and companion audio series called The Green Associate Exam Walkthrough ($29.95 for ebook or audio files alone, $44.95 combined) which is truly a study guide in that it features bulleted lists summarizing the most key points and does not waste a lot of space explaining things in detail. Purchasing the guide also gets you a duplicate version of the guide with a bunch of keywords omitted so you can fill them in as practice. Cons - Those very new to LEED or design and construction in general will likely have a hard time given how condensed the material is. No hardcopy edition available. Pros - Well organized and concise. If you have the magic ability to memorize everything you hear you could get the audio sessions and be done studying in just over an hour. The fill in the blank edition is the only study guide I've seen that offers study tools beyond practice questions, though the USGBC study guide does offer some group work. No hardcopy edition available (depends on your perspective!). Who should get these? - If you're already generally familiar with LEED but haven't gotten around to making that last push for the exam, this is probably the best guide for you. It's short and to the point without skimping on details, but complete newbies may have a hard time understanding some of the bullets. Though well prepared and even more concise than the study guide, the audio files are likely unnecessary for most purposes. This may just be my preference for reading over getting lectured to showing up... If you're thinking of only getting one or the other, definitely go with the guide and not the audio files. The professional test help juggernaut PPI has developed the most expensive set of study materials in their LEED GA Power Pack (Individually: $89.95 for the study guide, $54.95 for two hardcopy practice exams, $34.95 for flash cards, $9.95 for an online practice exam - All four combined: $170.85). I've only reviewed those mentioned above, though there are a litany of other options on their site ranging from a $299.95 multimedia CD-ROM to LEED GA flashcards for your iPhone ($19.95). The flashcards are taken directly from the primary references, and the study guide itself is quite comprehensive. Cons - First, cost. Second, the flashcards are terrible... not because they are wrong or provide misinformation but because they require knowledge so in-depth that I would wager they request information you wouldn't even need to pass the second Tier II exams. I've taught classes on this and have been working on LEED projects for four years and could probably not answer more than half of these questions... The study guide itself probably also goes into more detail than is required by the exam, but as you'll see in the Pros section I don't necessarily think that's a bad thing... At the same time, you can get the same level of detail in most instances with the free guide from Studio4 listed below. Pros - For those that are unfamiliar with the actual practice of design and construction or completely in the dark about sustainable practices, this study guide gives you some clear but comprehensive discussions about the sustainable design strategies component of the exam. The author did a great job explaining the larger issues surrounding sustainable design and construction. For the most part, the practice test questions seem to mirror those provided by the USGBC, and they have an online test simulator that mirrors the timing and format of the actual exam. Note that I did not actually review the online simulator, only the hard copy tests. Who should get these? - Out of the package that I reviewed, I found the practice tests to be most beneficial and would recommend them to anyone who was looking for such a tool. The study guide itself would be excellent for anyone very new to LEED or the design/construction industry in general, but anyone who has worked in the field for some time or is generally aware of LEED would likely find the comprehensive nature of the guide a little frustrating. No one should buy those flash cards unless you want to know far more than you need to pass the exam. Cons - The study guide is the largest of the bunch, clocking in at over 250 pages! Significant portions of the content have a narrative style more akin to articles than the concise language typically found in a study guide, but you can rest assured that if you need to know it it is likely in there. Though most of the question content seems appropriate, a fair amount of the test questions are vague and could be frustrating, but that's probably good practice for the real thing! At the same time I would probably still recommend the PPI practice exams over this one. The BD+C chart is great... but you don't really need to know all of that for this test either. Pros - The language is straightforward and the concepts are clearly presented. Larry's done an excellent job of linking within the document to official USGBC and GBCI website and guidance where appropriate for more information. There are resources in here that would benefit people who aren't even studying for the exam (e.g. info on the Harvard resource on page 14), and in general it's peppered with statistics and ideas you might find useful to convince a client about the benefits of sustainable design... LEED project administrators will find the timeline and project management section helpful outside the scope of this test as well. Those ultimately desiring to take the BD+C tier II exam will find the summary chart quite helpful. Oddly enough, this is the only guide I've seen with a significant amount of pictures included! Who should get these? - Similar to the PPI study guide, I think this guide will serve well those with limited experience in the field or those who are completely in the dark about LEED. I think those project administrators who aren't even taking the test may find this a handy reference to keep nearby. Those who are well versed already and are looking for a more concise tutorial would be better served by the Green Associate Walkthrough or the USGBC's official GA Study Guide. I wouldn't be doing my job well if I didn't point out a few conflicts of interest. I stand by my positions on all of the above materials as my honest opinion free of financial bias, but the fact remains that I received free copies of the PPI materials, the Green Associate Walkthrough, and the Studio 4 Study Guide. I also have an affiliate relationship with Green Exam Academy, the company that produces the Green Associate Walkthrough (see ads on right). I received no money or incentives beyond those just listed. If you have LEED GA training materials beyond those reviewed here, I will review them if you're willing to provide a free copy. Contact me via email for more info. Think I'm completely wrong? Is there something you found helpful that I didn't mention above? Please share by leaving a comment! This insight is very useful and clear for me regarding what materials to be given importance for the preparation. This is a wonderful service. Your review was quiet good. Except abt tht of GA walk through. In my opinion it is also good enough for new comers.I have purchased it yesterday.Had a quick review and found that he has summarised all the reference in easy to understand format. Thanks for the review. I'm a LEED GA and purchased the PPI materials. I came to the same conclusion as you re the flash cards: total waste of time/money. I focused on the book and the practice tests (which I found more difficult than the actual exam). It worked for me. One thing you may want to address is the fact that @ 20-30% of the questions (more on the PPI practice exams) are structured to have 2 or even 3 correct answers. If you correctly choose 1 or 2 of the answers but miss 1, you get zero credit. I found those to be the most challenging. How many day a week did your class meet over the 4 week period? This is akin to the "Close Cover Before Striking" College of Neurosurgery! Let's find a crib sheet to pass the exam with the least possible sweat. Did you really learn anything, or did you just pass the exam? This will be the end of LEED as a credible program to improve the built environment and it will become marketing pap for the credulous. Why is it that marketing trumps commonsense? In that regard I must have been prescient when I suggested to a corporate builder's conference choosing among LEED, Green Globes, and NAHB programs to choose a logo that is compatible with your corporate logo and colors! Your website is the best and as a librarian at an architectural firm, you have just saved my bacon. I wasn't going to buy any new LEED GA materials until someone reliable had reviewed them... and now you have. Continued success with your projects. st wanted to thank you for the reviews and advice. It is much appreciated - here is to hoping what goes around comes around mate! Have a beautiful summer - unless you live south of the equator, in which case, have a great winter! peace. Great information. I agree with the flash cards for the PPI being a waste of time. I do want to point out that multiple questions are structured with pick two answers. did you miss it- the USGBC and LEED already, long ago, became just marketing tools..You still need to study, but like the ARE it is a hoop to jump through.. how many grandfathered in LEED APs (especially from the early years when the test I hear was much much easier)could really guide a building through certification.. very few.. and when they do they grab their book.. no need to memorize, but that is what the exam tests mostly rote memorization, hence the need for these kind of study guides.. if you want truly sustainable architecture don't look towards the USGBC for guidance, in my opinion. I'm really frustrated by the cost of USGBC education. So much for the green jobs revolution pulling the economy out of the doldrums. I'm a paying member in good standing of a local USGBC chapter and found out that it doesn't "count" regarding member vs non-member class pricing. Only people who are with member COMPANIES get the benefit of discounted class pricing. As an individual trying to transition into green business and who is not associated with any company, I had to pay $260 for a 4 hour Intro to LEED course versus $175 for a "real" member. I was, and still am, beside myself angry about the stupidity of this situation. I appreciate your similar position regarding the cost of education and related materials. I am very thankful for all your hard work and advice you give to all people interested in LEED. I am currently studying to take the GA exam, and found your review interesting and helpful. My biggest frustration was tackling the GBCI resource material in the Candidate Handbook. Your statement - "... learning everything listed would be insane (way too much info)" was my exact thought. Surely they can't call it "basic understanding of Green principles" and then expect you to memorize all this!! All your efforts here are very much appreciated. I'm back on track with your 4 week study regimen. Which study guide is the best option if you want to learn what you need to in order to pass the USGBC Leed Green Associate exam? Cost is not an issue. just took the leed gam exam on new years eve and passed with a 187...happy new year to me! just a couple of tips for those taking the exam. the gbes study material and practice exam in addition to the everblue practice exams are more than enough for you to be prepared. I've been out of school for awhile and had my doubts about passing but just master the practice test and don't rush through the test, and you'll be fine. I say read all the study material once, go back to sections that are not clear right away to you..the practice test also helps you focus on sections to study more of. actual exam is hard. if your getting above 70 out of 100 questions right on your practice exam you should be good to go. Thank you very much for this Significant information regarding LEED. I am currently preparing to take the Green Associate Examination and your site really gave me the benefits of having not just free educational information but more concise and very organized topics. Again Thank you very much for this Great Site. In the readings for the materials you list page numbers in various pdf documents. I understand where most of these come from (for example, I know what the Core Concepts guide is and where to get it), but it is not clear where to get the other materials (cost of green revisited, Guidelines for CRI customers). Are these all published by GBCI? Perhaps I missed something from an earlier post? All the pdf's reference can be found in the LEED Green Associate's Handbook under Section 3. He provided the link to the handbook in the beginning of this post. Its me again. I was able to qualify for LEED GA Exam and I just have to decide when to take it. So taking a Sustainable Construction Course in my grad program helped me qualify. Hope this information helps. I'm a little confused. In the 4-Week Study Guide outline, there are readings out of the Core Concepts Guide, but then below in the study material review, it is suggested to not purchast the Core Concepts Guide. If I want to follow the 4-week study program, should I buy the book from USGBC, or is there supplemental readings I can read instead? Funny...I have the same question as the post dated 2/9. You stated that the USGBC book --Concepts Guide--is not of any value yet you list it in the 4 week study program listed above. You have given course material in Week 2 - LEED for Homes Rating System - pg iv-xvii (pg 4-17 in pdf). instead of pg 4-7. pl change. There are a ton of new LEED apps for the iPhone, most of which are not rated. Can anyone give me their opinion on any of the apps so i dont end up wasting more time or money? I just failed the LEED GA with a 169, one point away. I used several sources to study from but was very suprised with the exam content that there was nothing on the various ASHRAE sections, Green Label, Geen Seal, etc... as well as those annoying USGBC logo oriented questions. All of wich have been on the various stufy guides. Between the application fee, the test and all the study guides I've lost close to $350.00 on this whole thing. Very frustrated at this point, especially because this wont really do anything for me other than have something I can put in my e-mail signature. I am generally interesed in the content, but I am disgusted with what appaers to be a racket to extort money from people in the design field. I even took questioner at the end of the test and I knew I was doomed when there was a question how much your salary is. C'mon, what's up with that? Next year make it $250.00 an exam? This is crazy, but I guess I'm just bitter at the moment. I think these are great recommendations. Unfortunately, I misplaced my reference book and only studied the flashcard and practice exam (most got a 50-80% passed on the practice exams). I used to intern for a construction company and my coworkers were able to take a LEED class and took two days off to study the test. Most passed the first try. I took 4 days to study and passed the test with a 175. I really wish I study more but this the approach that I took if you are short on time. Your site is absolutly the most helpful site online. Thank you for taking the time to put this together. I as well as many LEED hopefuls thank you imensly. I took the 2 day course with Everblue at the Univ. of Houston. The instructor told us what would be on the exam...Wrong! The exam was totally different from what he described. It was only because I've spent 30 years in Construction that I passed it!Barely. I would like to be a AP but am now unemployed and can't afford to get the materials. I took the Everblue training for LEED GA and was very satified. If I had any problems with the training it would be that maybe it is not detailed enough. When I took the GA exam, it was much harder than I expected because of all of the stuff outside of the GA materials you were expected to know (stakeholders, community involvement). Also, the Everblue practice exams are about 50% easier than the real deal. However, they do get you thinking about the questions and get you to research the answers. Everblue will get you on the path to preparing for the exam, but it is up to you as to how much additional time you put into studying. u site is really helpful . plz can u tell me how it is possible to achieve an professional experience which is required to become an leed ap ? Just passed the LEED GA and I wanted to thank you for this site which was helpful, as the accreditation process is not very intuitive. I found the Studio4 study guide online for free and it was the most useful tool, though I also purchased the USGBC Core Concept and Study Guide. In addition, I downloaded all of the resources freely available online and studied those. All in all, I got a 192 out of 200 for a minimal amount of purchased study resource! Is anyone interested in selling their "Green Associate Study Guide w/ Green Building & LEED Core Concepts Guide" combo for a good price? The advice you've given is tremendously useful. Given the difficulty of the exam, it is important to spend a lot of time studying and understanding various techniques that will increase your score and bring you on your way to LEED certification. For more tips of how to pass the LEED exam, visit http://leedcertification.wordpress.com/2011/11/15/6-secrets-for-passing-the-leed-exam/. Hi, I passed the LEED Green Associate in October with a 187 and the LEED AP O+M with a 190. The LEED AP was a super hard test. This is what I did to prepare for the Green Associate: I took a one day class and purchased practice questions from Green Building Education Services. I crammed for three days. This is what I did to prepare for the LEED AP: I spent three months preparing. I read through the entire reference guide, I read through the USGBC study guide, I took a webinar from Everblue and also did their practice questions, and I also did all four practice exams from Green Building Education Services, which will do a a free upgrade if you purchase practice questions for the Green Associate test. I think both Everblue and Green Building Education Services had strong programs, but the practice test questions on Green Building Education Services were more up to date and were more challenging - like the real test. The AP test itself was difficult, and some of the questions made no sense to me. I am glad that I passed, but you do have to be prepared. Given my work situation, failing the test was not an option for me. You can pass too if you spend time studying and doing practice questions. Has anyone tried the "LEED Green Associate Study Guide" as developed by greenexamprep.com? I'm currently trying to decide between this resource and the greenexamacademy.com study materials. It's the one with 107 pages that I reviewed... I have not seen a copy of the larger one yet. i have one question that is about the exam it self......is it a multiple awnser(choose 3 or 2 correct awnsers), if yes , the exan interface ganna note me that i need to chose more than one awnser !!!! is there an exam tutorlais other than the one in the test exam ?? I read the resources you listed in your 4 week plan a few days out from sitting my exam. I found your list much less overwhelming than all the materials listed by the USGBC. I passed my exam, wanted to say thanks for pointing me in the direction of some useful reading material!!! I didn't purchase any materials in the end, but the Green Learner exam simulator was probably the most helpful tool I also used. what i did to prepare!! i read all usgbc free materail + green core concept + tuns of practise test ....the practise exam where Green Building Education Services. * noe i need to ask , is my grade 179/170 good as a test avarege or its below avareg!!!! i took the GA test and i passed with score of 186.
my advice for everybody, do not try to solve any sample exam where you don't have its solution becasue you might be answering wrong without knowing what the correct answers is and why? Thanks for Sharing this great Post! As, i am also planning to prepare for LEED green associate exams. Looking forward to contact you as soon as i can.